The run and coop as they look tonight. It’s been over two months since we brought home our four balls of fluff. I predicted from the start that we would end up with grown hens wandering the house and an unfinished chicken coop in the garden. This has (almost) come to pass. 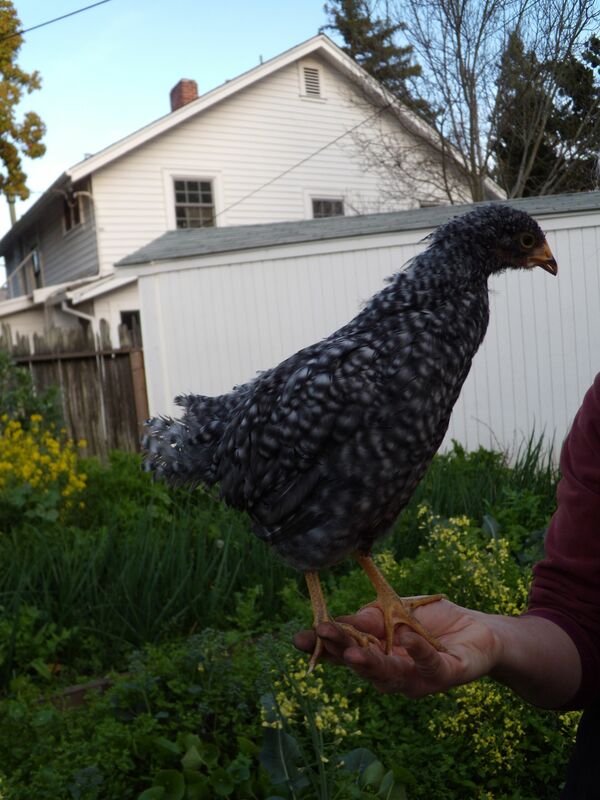 The girls are fully feathered, can fly quite well, and are alternating their baby peeps with noises that sound distinctly like the cries of egg-laying hens. But the coop and run really are almost finished—we promise—and the girls will soon be liberated from their cramped cardboard box. 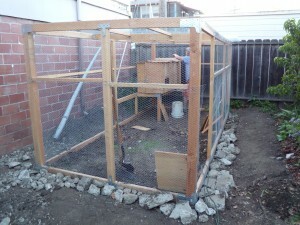 Though the coop is not quite complete, I am proud to say that we didn’t procrastinate. Rather, it turns out that building a raccoon-, possum-, skunk-, and rat-proof home for chickens is a huge job for people with no great carpentry skills to speak of. Kelly is the hero of the endeavor, and I the sous builder who scampers to procure the proper screws and hold the avian wire in place. This project reminds me how much I dislike hard physical work. I want to like it. I take up hobbies that require it, but at the end of the day, I am much happier admiring the completed project than I ever was digging ditches, or hauling concrete chunks, or even pounding nails. Kelly, on the other hand, finds this project pleasing (if also exhausting and overwhelming). As I write this, I can hear her pounding away on some of the finishing touches. 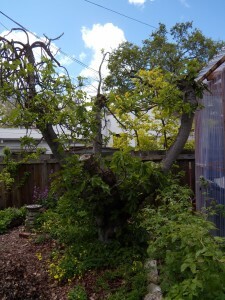 I got special permission to leave the job site to write a long overdue blog post, and I promised to sing her praises. This is not too onerous a task for me, and she deserves it. 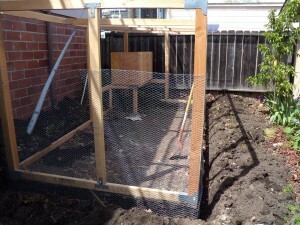 Kelly has spent nearly every one of her days off over the past few months working on the chicken housing. She has an eye for detail and a perfectionistic streak and has refused to cut the corners that I might have been tempted to. This morning, we put on our Sunday best and paid a visit to our “chicken coop neighbors”. Their kitchen and bedroom windows and balcony look directly down onto the coop. We were nervous. Turns out they seem to have guessed, due to the large cage-like structure we have been banging away on for two months, that some type of livestock was moving in. Surprisingly, they were all smiles, especially when we assured them we plan to share eggs. They even suggested that their little daughter might be able to come pay the chickens a visit when the birds move into their new home. The run is seven by fourteen feet and fully protected from chicken-eating creatures. Half of the roof is covered with avian wire, and the other half is covered with clear corrugated plastic for rain protection and maximum winter light. We dug a trench a foot deep around the outside and sunk the avian wire to prevent critters from digging in. We filled the trench with “fine” concrete rubble (i.e. small concrete bits, plus dirt) and arranged large concrete chunks on top. 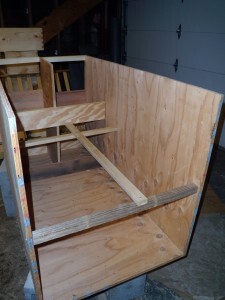 We built a two by four foot coop with nest boxes and mounted it in one corner of the run. There are doors for us to collect eggs from the outside. We included four nest boxes (probably overkill, as we’ve read chickens can share) and a place for the birds to roost. 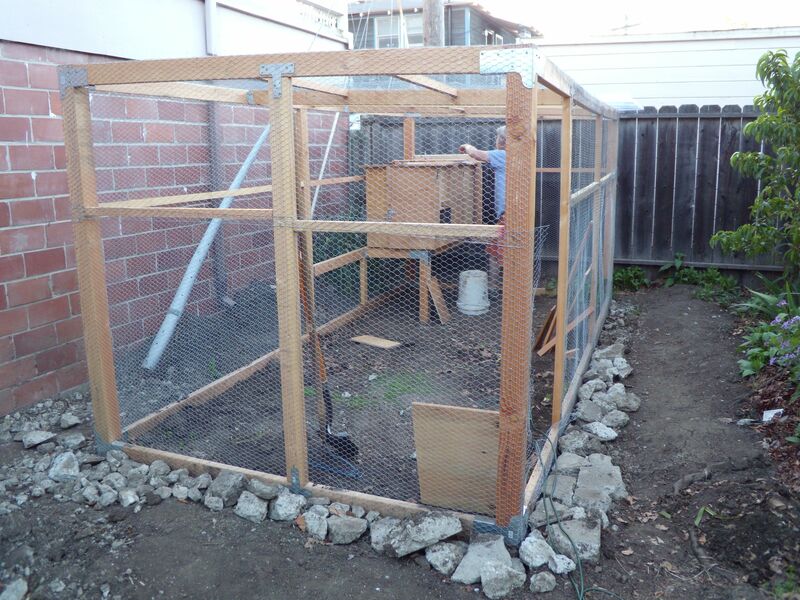 Kelly designed two doors that open into the run: one for everyday chicken use, and another for cleaning out the coop. She also came up with several screened windows that can be opened or closed seasonally for ventilation. The final touch is a door for us to access the run. 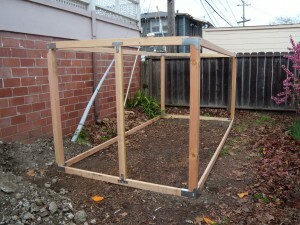 A beekeeping friend of ours generously offered to build it, and we should install it in the next few days. Hurrah! The partially constructed coop with roost and nest boxes. 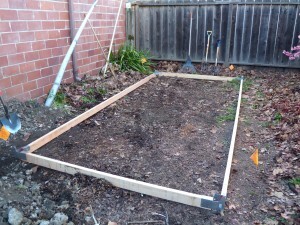 The trench, beginnings of avian wire, and mounting of the coop. Olive eyes the great outdoors. We are now eight days past our target date for moving the chicks into their coop. We have been doggedly hammering away for more than a month now and have made significant progress on the chicken coop, but swarming bees, busy work schedules, and taxes have gotten in the way of many a would-be workday. As I write this, I can hear the chicks’ incessant chirping and the occasional indignant squawk drifting from their cardboard box through the house. They are impatient. Cramped, bored, and hormonal, the two gray Leghorns bristle at each other, craning their necks to stand taller than the other and occasionally leaping with sharp toenails (chicken talons?) outstretched. Olive, the sneezing chicken, seems to have claimed the top position, but Fiona hasn’t given up yet. They frequently miss out on treats because they are so preoccupied with their dominance drama. Meanwhile, Petunia and Luma (more commonly referred to as Baby Tiny) are comparatively peaceful and much less physically developed. They lack the bright red combs and wattles that their sisters grew a month ago, and they are noticeably smaller and less bulky. Luma’s differences can be chalked up to the fact that she is a week younger than the others and a different breed (Barred Rock). We have wondered, however, whether Petunia is not actually a Barred Leghorn, but some other mystery chicken breed. 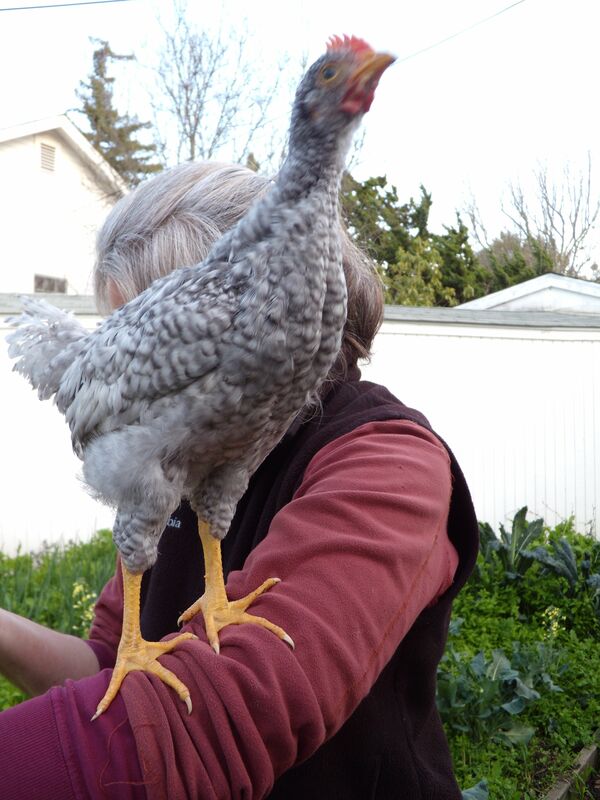 Petunia has developed a penchant for flying and is constantly on the lookout for new perches. A few days ago she flew the length of the guest room turned chicken room, flapping into the curtain before landing unceremoniously on a stool. She likes to perch on the rim of the box while we clean it and surveys the proceedings with quizzical chicken glances. She seems especially fond of Kelly and will climb up on her outstretched hand in hopes of being lifted to a better vantage point. In an effort to prepare the girls for the real world of the backyard, we recently began turning off their heat lamp for periods of time. We had lifted the lamp gradually higher over the box to reduce the heat as the chicks grew older, but turning the light out entirely seemed like a natural final step. It also seemed like a good way to teach the babies about night and day. They have been living in perpetual day since they were born, and we worried that sticking them out for their first night in the dark coop might come as a rude surprise. With the light off last night, the chicks were silent. We peeked in before bed and found them sprawled on the floor of the box. I turned the light back on and opened the curtain at 7 o’clock this morning, and the chicks dutifully took up their peeping and scratching. With any luck, Kelly and I will finish the final touches on the coop this weekend and get the girls moved into their new abode. Note: final touches, in this case, equals filling the trench, attaching aviary wire to the frame, making and hanging a door, and notching the frame so that the coop’s egg-collecting doors open smoothly. Wish us luck! This is what three-pound packages of bees look like. It’s been a busy, even crazy, week for bees around here. Between hiving packages and catching swarms, we’ve barely had a breather, and since there seems to be no way to do each event justice at this late date, here’s the recap. We spent all day dispensing three-pound bee packages to guild members. Altogether we distributed about 150 packages and answered multiple questions about queen cage placement, feeding, and candy plugs. At the end of the day, Mike, the guild’s “bee package guy” offered samples of his homemade mead. Kelly is even more eager now to experiment with mead-making. We took home two packages of bees: one Italian and one Carniolan. Saturday’s rainstorm finally broke, and we hived our Italian bees in the late afternoon at one of our new host sites. 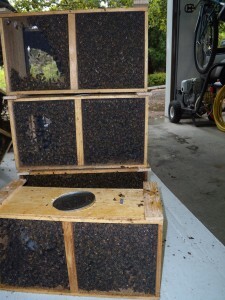 We used last year’s Kenyan top-bar hive, and added a one-gallon Ziploc bag of 1:1 sugar syrup to get the bees going. While we usually use stacks of two cinder blocks for hive stands, we added a third layer to get the hive out of reach of hungry chickens. Kelly holds up a queen cage with a black candy plug before stapling its metal tab to a top-bar. We spent the rest of the evening pounding frames together and adding foundation for a new 10-frame Langstroth hive for the Carniolans.. 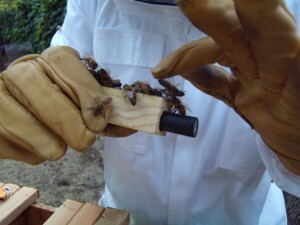 Previously we used eight-frame equipment, which makes for lighter, easier-to-work hives. We are interested, however, in experimenting with Serge Labesque’s method of beekeeping, which involves using eight frames with follower boards in a 10-frame hive body to promote air circulation. After picking up a 25-pound bag of laying crumble and chick scratch for the practically grown-up chicks, Kelly received a phone call from a beekeeping friend who had two swarms: one huge one, about 20 feet up in a magnolia tree, and one small one about two feet off the ground. 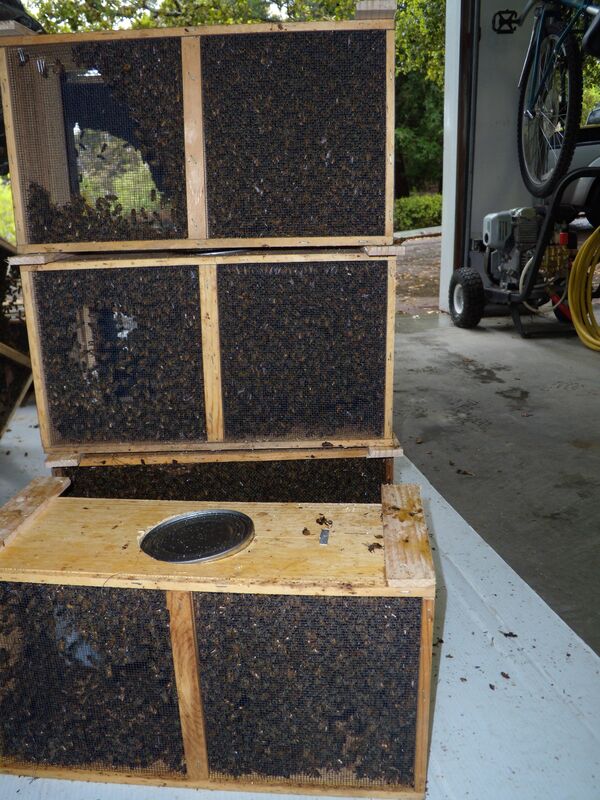 The large swarm went to a longtime beekeeper who experienced major losses over the winter, and we got the small one. We raced to gather half the equipment we had prepared for our package, and set up a new hive at a second host site for the small swarm. Unlike our multi-queen swarms, this group of bees seemed extremely well organized and competent. As soon as we dumped them in the hive, they came out the entrance, fanning their pheromones in the air to let stragglers know that the queen was inside. Back at home, we hobbled together enough equipment for the Carniolans and set off to hive them at a third host site. After spending six days in a wood and mesh box with a can of corn syrup for sustenance, a number of the bees had died, but the group seemed thrilled overall to be released. Sarah made the rounds to all three host sites, and checked and refilled sugar syrup. All told, the trip took about two hours. We checked the queen cages and found that both package hives had chewed through their candy plugs and released the queens. This is good news. The mated queens can now start laying eggs. We abandoned making frames in the evening in favor of washing dishes and collapsing. Our top-bar had already swarmed, so there was no reason to be prepared for anything. Right? 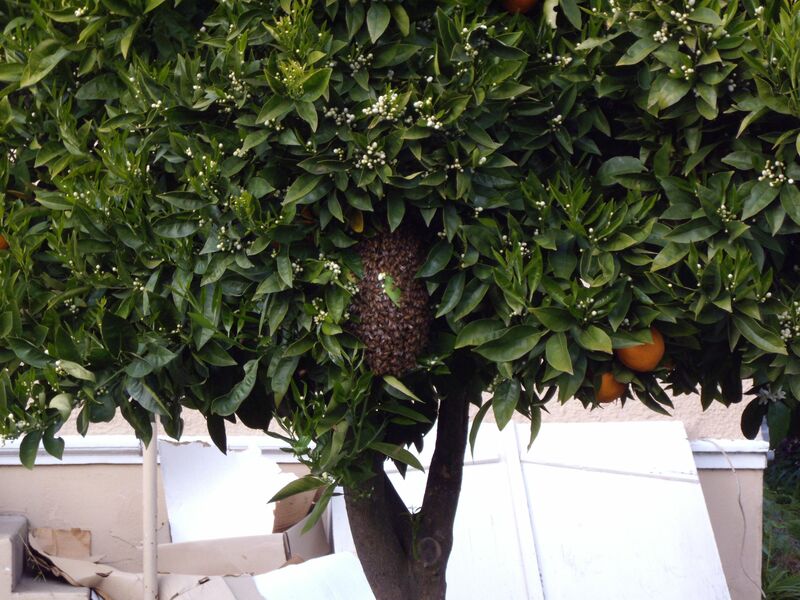 We came home from a long day of work to discover (quite by accident) a swarm in our orange tree. The bees were only about five feet off the ground. We stopped making dinner and hastily modified a top-bar hive that we deemed too deep by using a jigsaw to cut it in half. As dusk approached, we suited up and Kelly skillfully pruned off two small branches from which the bees were hanging. While Sarah stood at the ready to put top-bars in place, Kelly slowly walked through the garden holding a dangling swarm. She shook the bees gently into the hive and we replaced the top-bars. 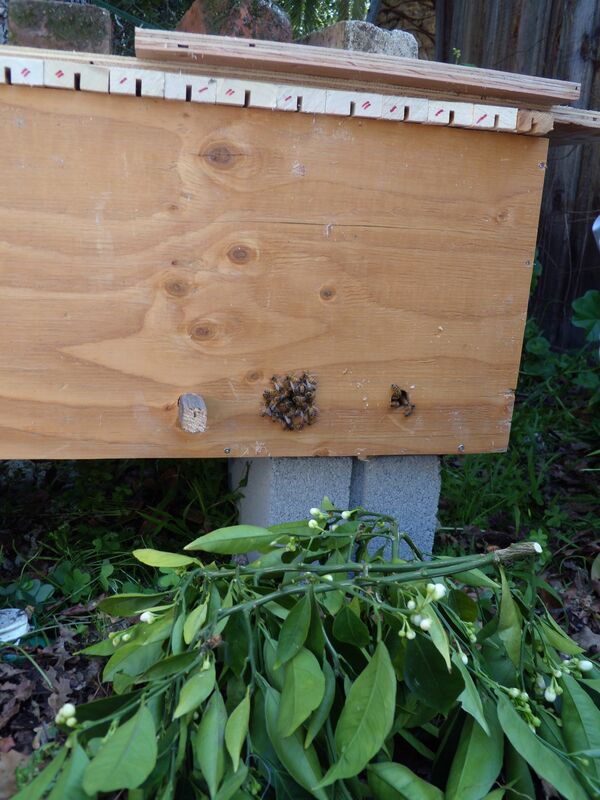 Had our top-bar hive, Mondo, swarmed again? We weren’t sure. Lying with our heads under Mondo, we looked up with a flashlight and watched bees tending a queen. The hive appeared much emptier than it had, and the bees seemed agitated. As we watched, the queen darted out of sight between two combs, but minutes later we spotted another queen alone on the back wall of the hive. She began piping. The noise is strange and distinctive. It sounds like a high-pitched, bleating buzz. From our understanding, this is a behavior exhibited by virgin queens to call out other virgins to fight. The piping continued for 10-15 minutes before we went back inside to fix dinner and make frames. 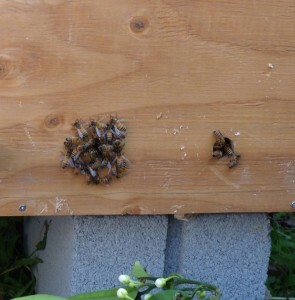 During breakfast, we noticed a handful of bees with their butts protruding from the entrance of the new top-bar hive. We saw little in the way of orienting flights, which we would expect to see from a new hive just getting their bearings. The new top-bar bees preparing to swarm. As the morning progressed, the bee butts grew more numerous and we became anxious that the colony was preparing to swarm again. We hastened to anchor foundation wax in the frames we had built, and Kelly abandoned painting hive equipment. We suited up and took a look inside the new top-bar. We saw a total of five different clusters of bees, with the largest spilling out the entrance. Presumably, each cluster surrounded one queen. 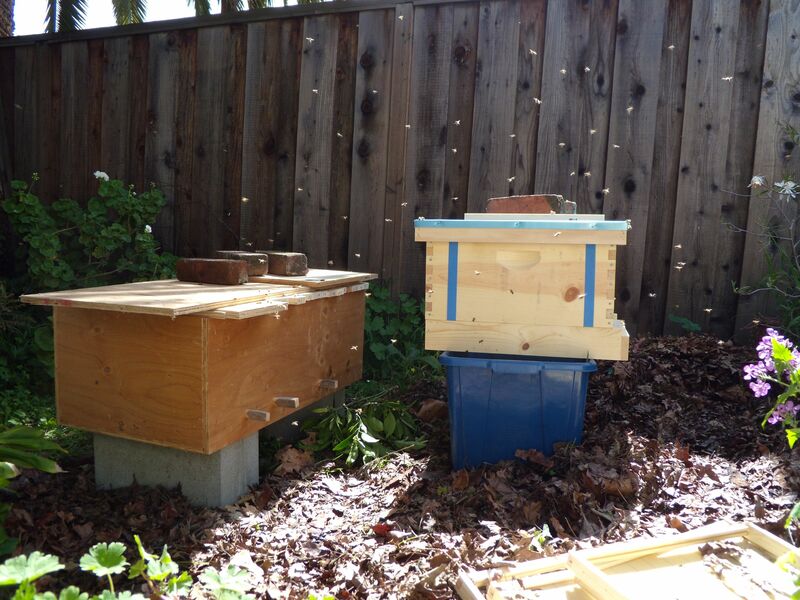 To prevent the larger, more vigorous group from getting away, we dumped the whole box of bees into the Langstroth hive we had prepared. We theorized that this would at least slow down the swarm which was beginning, that the bees might be more apt to stay put when they found themselves in a hive that already contained wax, and that the smaller space might force the multiple queens to finally duke it out. It appears we were correct. In the aftermath of the hive transfer, there was a cloud of bees trying to figure out where they belonged. But while we congratulated ourselves on our quick thinking, Mondo was on the move again. At lunchtime, we noticed large numbers of drones at Mondo’s entrances. As we pounded away feverishly on our still unfinished chicken coop after lunch, we heard a loud buzzing. Sarah went to investigate, and spotted yet another swarm high in the camphor tree. We are almost sure that it came from Mondo. 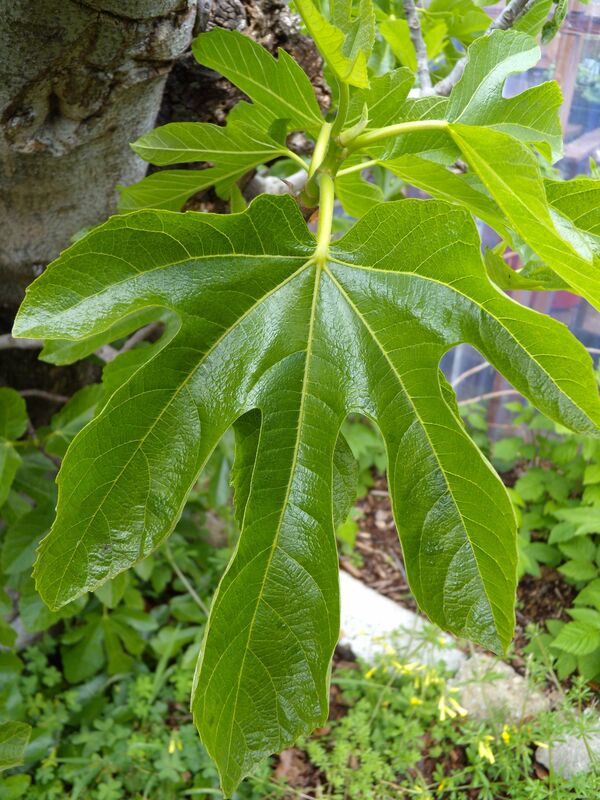 In a matter of minutes it dispersed, moving as a cloud over the neighbors’ house, dipping toward their wisteria, then through the liquidambars and across the street. It finally settled again about 30 feet up in a huge tree. Like any mothers, we feel glad and proud that they are in the world, and we worry for their safety.